Rustic kitchen designs are popular with homeowners, as they can add a sense of warmth and comfort to any home. Some of these types of kitchens feature a rural, country look and feel, while others emulate the look of a cabin or mountain lodge kitchen. If you want to incorporate rustic earthiness in your home, you'll have many rustic kitchen designs, themes and materials to choose from. Most rustic kitchens are designed around a particular American regional decorating style, such as Southwestern, Pacific Northwest or Adirondack themes. Others resemble the typical type of architectural features, colors and decorations you would find in an old world villa, farmhouse, log cabin, adobe hut or ski lodge. The unifying factor between all these types of designs is that they typically bring in natural elements and colors to create a casual, cozy kitchen atmosphere. Many feature wooden beam ceilings, stonework and other weathered-looking design materials. Comfortable, open seating areas to accommodate large groups of people are other common features found in all types of rustic kitchens. You can choose from traditional designs or even contemporary designs. The rustic kitchen usually features wooden cabinets made from hickory, knotty pine or alder materials. Some homeowners choose cabinets that have rustic door designs, knobs or carvings to add additional style and texture to the kitchen. There are also many types of rustic kitchen countertop design materials to choose from. Some designers use concrete countertops to blend the countertop area with a natural stone backsplash or wall. Others use brick, granite, marble or soapstone to bring in additional natural elements and materials. If you are planning a rustic design for an open floor plan that features a large kitchen island, consider using wooden, butcher block countertops. Butcher block counters can add a warm color and be functional at the same time. Choose a sink material that fits in with the rest of your design. For example, if you have a rustic-contemporary kitchen that features concrete or granite countertops, you can install a granite or stainless steel sink. If your kitchen has more of a farmhouse theme, then you can use cast iron for your sink material. Other common rustic materials include soapstone and limestone. One of the popular sink trends for this type of design theme is the apron sink. Apron sinks feature high backs and low fronts that make them easy to access and use. Many rustic kitchens feature informal dining areas that work to create a welcoming, comfortable environment. Use natural table and chair materials, such as wooden plank tables with benches. Place wooden or wrought iron bar stool chairs beside kitchen islands to create additional seating areas, as well. If you have a country theme, you can use white-washed chairs with straw seats or add color with tie-back seat cushions. Some homeowners use rustic barnwood furniture in their kitchens. Complete your overall theme and design by choosing appropriate decorating colors and accessories. One of the most common rustic decorating colors is orange, as it adds warmth and complements wood and other rustic design materials well. Other rustic paint colors include red, yellow, brown and green. Use natural colors that reflect the outdoor setting. Many designers use some form of copper in this kitchen theme. 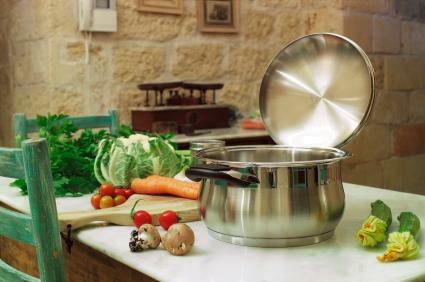 Hang copper pots and pans on the walls or from the ceiling or use this metal in your stove design. Decorate with accessories that go with your theme. For example, if you have a mountain lodge theme, decorate with antlers or pine cones. If you have a farmhouse theme, you can decorate with cow or chicken accessories. The main key is to add enough decorating elements to tie the different design features together.